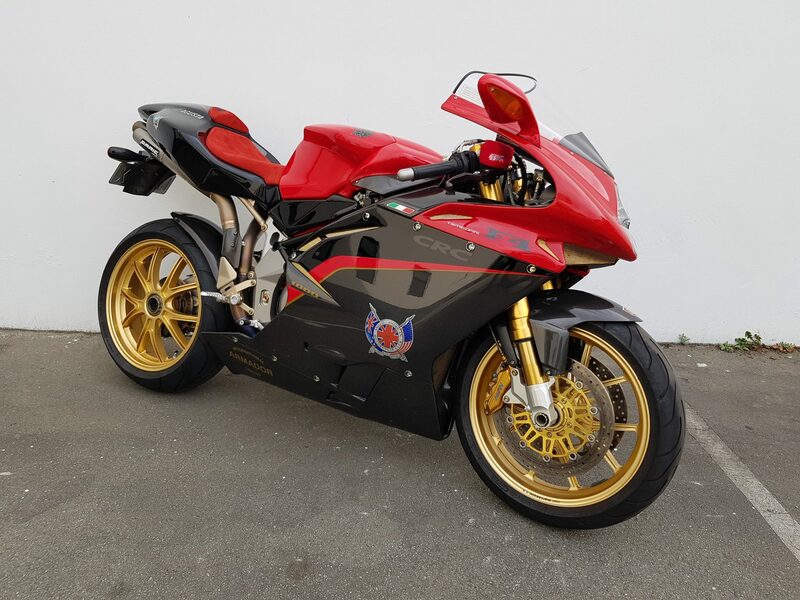 First shown in 2005, the F4 Tamburini was a special edition of a special edition. A tribute to the man himself, the Tamburini took the standard bike and equipped it with the finest parts available. The entire bike was wrapped in carbon fibre (bar the tank) and had an F1 derived Sachs shock, 50mm Marzocchi USD forks, lightweight Nissin brakes and forged Marchesini wheels. Combined with plenty of magnesium, including the fork crown and swingarm, the F4 Tamburini tipped the scales at just 183kg dry. The Tamburini wasn't just a tart up of the original F4 1000 either it was the first model to feature variable length intake tracts to improve the low end torque, without sacrificing outright power. The result was 170bhp and a top speed in excess of 190mph. A fitting tribute to one of motorcyclings keenest eyes. This bike is the 112 unit of 300 produced worldwide, and one of two in New Zealand. This is a single owner bike that has been used very infrequently over the years, this is indicative when looking through the images - The bike is beautiful, a real show piece. The bike is standard, bar the Bodis full titanium exhaust system - This is rumored to have cost $15,000's at date of purchase....! The personalised plate, MVSEX, will be included in the sale. Viewings welcome, if you require any further information don't hesitate to contact us. First European are proud to be the official Canterbury and Westlands MV Agusta, Benelli, Royal Enfield, SWM and Norton Dealers. We are here to provide the motorcycling community with the very best sales, service and parts experience possible. All our staff are motorcycle fanatics, so if you are looking to purchase a new or used motorcycle, needing parts or accessories, or require Servicing, WOF, Compliance on imported bikes, give us a call. With our A Grade Technicians we can provide you with the very best after sales service in town, Race bike preparation, custom bike mod's, winter projects, we are here to help you get the very best out of your ride. Our Throttle Stop' coffee club is a great place to start your ride with fresh barista made coffee and a selection pies,pastries and slices accompanied by some great bike reads it's a real bikers' haunt. We carry great stocks of riding apparel from such brands as HJC, Caberg, Octane, Ixon, Sidi, Forma, Five, etc. Competitive finance is available through Oxford Finance with high speed approvals on our Auto App software. Our insurance packages through Star Insurance are second to none! Call us for a quote.